If Hitler had his way and the Nazis developed an atomic bomb before the allies, the world in which we live would be a very different place. A surprising new find by a German relic hunter suggests Hitler may have been closer to his goal than we thought. Bernd Thälmann, 64, was out and about in Berlin last week with his metal detector when he stumbled upon a rather strange, non-magnetic lump of metal. Naturally, Thälmann brought his unusual find home, but after a brief examination he became somewhat concerned and notified the authorities, the Berliner Kurier reported. A smart move, in retrospect: Thälmann’s find was, in fact, a piece of radioactive material. The area he was surveying, Oranienburg, was the location of a secret Nazi nuclear test facility which was annihilated when the allies dropped over 10,000 bombs on it. Emergency services evacuated and cordoned off the surrounding area as a precaution while Hazmat-suited officers packed the suspected radioactive material into a lead-lined suitcase and sent it for testing. It was then that the presence of radioactivity was confirmed, with Thälmann now under investigation for unauthorized possession of a radioactive substance. He’s unwilling to tell police exactly where he found it, however, as he wants to go back and explore the former facility some more. He would be wise to do so with caution. 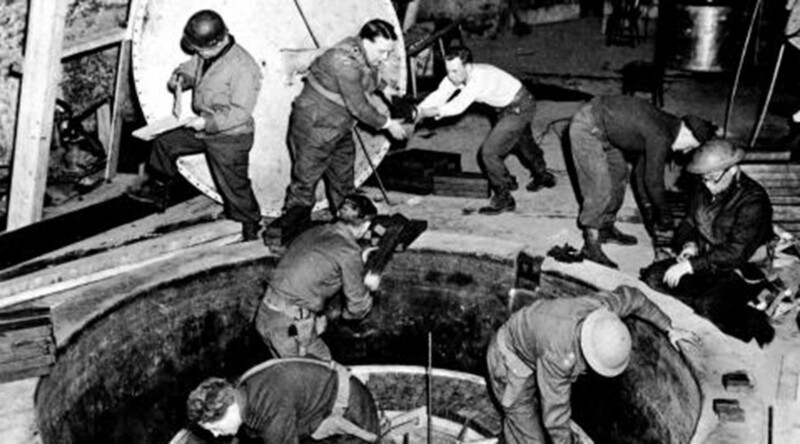 During the war, the allies were well aware of Hitler’s nuclear ambitions and successfully halted them, most notably in 1942 when nine saboteurs scaled a cliff to destroy a Norwegian heavy water plant under Nazi control. The question as to whether the Nazis managed to develop a nuclear weapon has popped up before. In 2005, historian Rainer Karlsch claimed that they even got as far as testing up to three bombs in 1944 as the allies closed in on Berlin, reports Der Spiegel.